In the midst of fall, you can’t help but to think about change. About changing, and closing one chapter to start another. About letting go so you can move on. Trees lose their leaves to help them survive a harsh winter filled with heavy snow and ice. What can I let go of to help me prepare for my winter? What is going to weigh me down when the elements try to take me down? I have decided. I am going to let go of my lack of confidence. I am going to let go of my overly critical, self deprecating self. How am I going to weather the storm if I am holding on to useless thoughts? I over think every thing- every interaction I have, every ride, every stride. If I think I could have done something better, I beat myself up, not for minutes or hours or even days. I beat myself for years. I beat myself up over many things that no one remembers but me. I worry that people won’t see who I truly am or the talent that I have. I worry about what I am going to do and what I am going to say. I worry about mistakes that I haven’t made yet. That ends now. 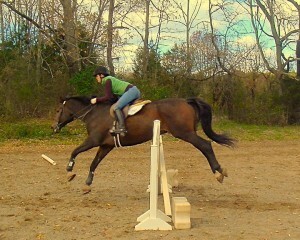 I have spent my life dedicated to bettering myself- both in the equestrian world and in the “real” world. I have accumulated knowledge and experience. While there is always room for growth, I need to remember that I am not a nervous 14 year old girl. I am confident 30 year old woman who owns her mistakes and learns from them. So, as the trees lose their leaves, I am going to lose my negative thoughts. A few at first. Then, with a big gust of wind, they will all blow away. Leaving room for new growth, new positivity. Leaving room for buds of happiness that will grow into true joy.